Our neighbor is a man of impressive stature. If I had to guess, I'd say he's 6'5 and 300 pounds. His gnarly hair, most often in a ponytail, reaches midback and is tied with one of his many bandanas. His beard is of equal length down his front side. If he's not wearing all leather, he's wearing Harley Davidson issued denim from head to toe. 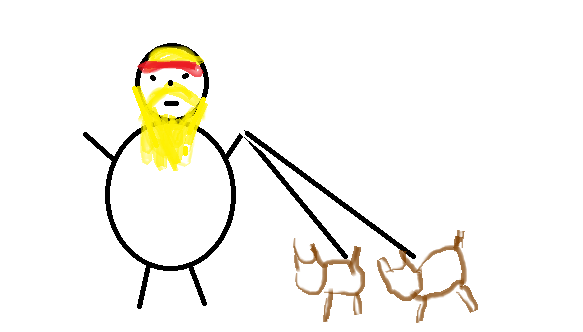 He has two dogs. Guess what kind. Pitbulls you say? Nope. Guess again. Pomeranians. Two tiny, yipy pomeranians. 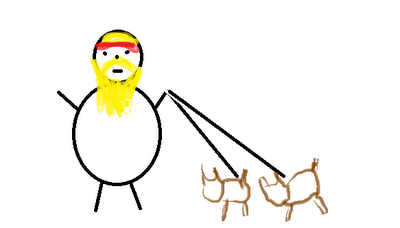 I really should have pursued a career as an artist. I wonder why he chose the canine companions that he did. Was he trying to be ironic? Is he a noncomformist? ﻿Did he inherit them from his mother? Was it simply love at first puppy sight? I've thought about asking, but so far I've failed to think of a better question than "Hey big dude, why the small dogs?" I'm afraid because maybe he's trained the pomeranians to be killer attack dogs and if I ask my tactless question, I'll meet certain death. But now I'm just stereotyping, aren't I.
I would be impressed if he found it.